The villain Mojo Jojo has kidnapped all dogs in Townsville and turned them into evil robots. 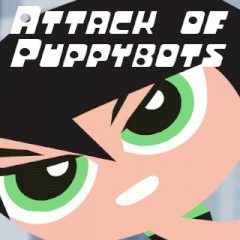 The Powerpuff Girls are doing to rescue the poor puppies and punish the evil Mojo Jojo. You are controlling the Girls, and your task is to destroy everything that moves and release the doggies from iron armor. Have fun!